Provides natural source of proteins, mainly for cell cultures. Significantly stimulates cell culture proliferation, especially at the initial cellular growth stage. Calf serum does lose its nutritious values after multiple freezing and defrosting. 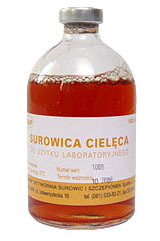 Serum is obtained from clinically healthy animals, free from infectious diseases, examined by veterinarian. Sterilised through filtration. Control test of calf serum include sterility, pH (7.8 ± 0.3), osmolarity (260-320 mOsmol/l), total protein contents (5.0-9.0%), absorbance (less than 0.6 by 415 nm), suitability for cell cultures.